The MultiTaction UNB display features a Clearsight touch tracking engine, operating at 120 Hz. The ultra-responsive multi touch experience makes the user feel like they are only touching the content, not technology. 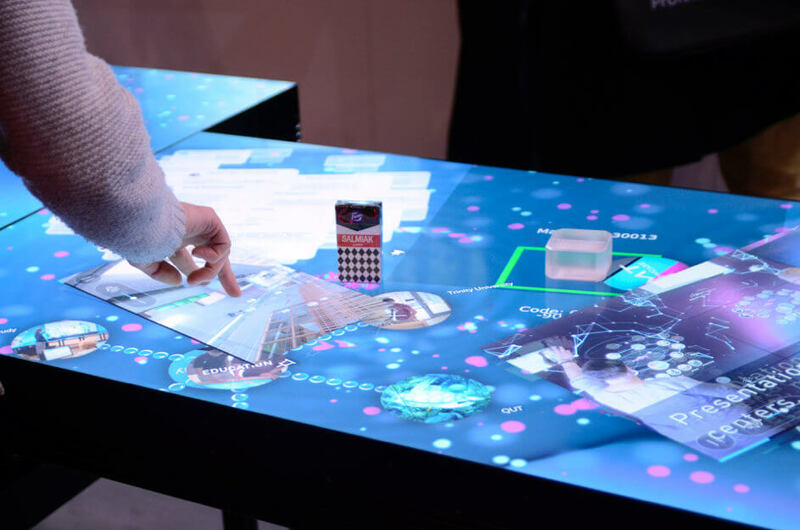 Additionally, UNB’s intelligent multi-touch surface can respond to fingers, hands, infrared pens or 2D codes for unique interactivity. It is also operating at a much lower temperature, which makes it more comfortable to use over extended periods of time than the previous MT555UTB. MultiTaction integration partners will also find that the mounting design of the UNB display gives them great opportunity for the low-noise, low-heat designs that are typically being specified for elaborate Customer Engagement centers, e.g., UNB can be mounted flush against a wall. Because of the low power requirements a greater number of displays can be connected to the same power phase. The new thermal design with stronger aluminum frame provides better LCD protection and rear accessible panels for service while mounted. The unlimited multi-touch points per display and unlimited stacking provides a solution that AV integrators can scale to any client requirement. MT STACK SYSTEM: A unique framework that allows iWalls to be constructed in all sorts of shapes and sizes based around UNB. Everything from floating cubes to almost completely circular rooms have been delivered. CLEARSIGHT TOUCH: Unlike most touch technologies, the MultiTaction UNB can see what is touching the display through the glass. This allows for a more immersive experience. MT CODICE: A 2D barcode that can be read by the UNB display surface. The MultiTaction software can react to the code making it possible to customize the application behavior or content to an individual or product. UNLIMITED TOUCH: Truly unlimited usage by hands, Infrared Pens and 2D barcodes. MT SHOWCASE: The perfect software to engage visitors with touchscreens and interactive video walls. MT CANVUS: A family of software products that help organizations visualize big data, socialize ideas, educate clients and work collaboratively. MultiTaction designs advanced visualization and collaboration solutions to improve the way the world works. Its award-winning 3D optical recognition multi-touch displays, and innovative software suite are used by some of the world’s largest corporations, museums, educational institutions and entertainment companies. With solutions deployed in over 50 countries and offices across the United States, Asia and Europe, MultiTaction is a global business.